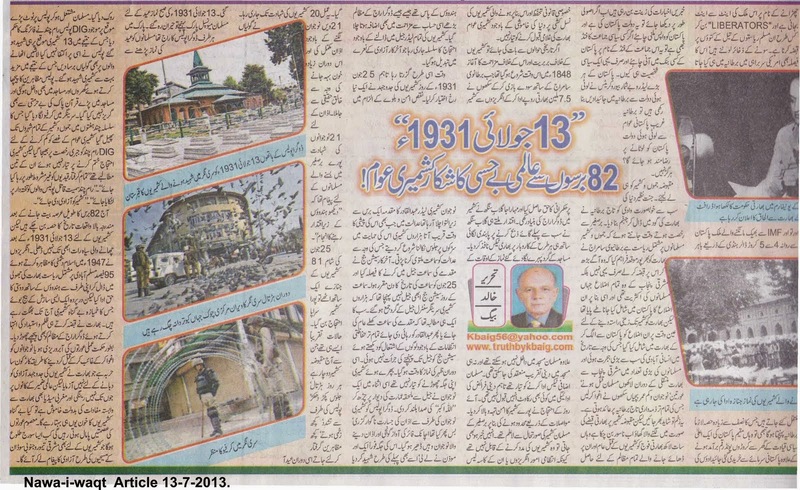 Truth by Kbaig: “13 July 1931” Kashmiri People Suffering Ignorance of International Community from Last 82 Years!!! “13 July 1931” Kashmiri People Suffering Ignorance of International Community from Last 82 Years!!! In today’s developed and civilized era only priceless commodity is the blood of Muslim that are murdered and tortured everywhere in the world without any fear of accountability. This series started in eighteenth century when flag bearer of democratic values and human rights Britain started capturing sovereign Muslim states in the name of supporting democracy and transferred their resources to Britain. In order to secure her proxy reign over these defeated states before granting them freedom British created such disputes that in spite of passage of half century these disputes could not be resolved. This is also a bitter reality that despite of freedom from British imperialism these countries are still under the control of Britain through any means and series of transfer of resources and wealth to UK is still going on. All types of NRO’s are compiled and prepared in Britain. When any country is to be devastated under the fake excuse of “Weapons of Mass Destruction”, when and how a country is to be ruined under the allegation of ‘Dictatorship’ or when and how to capture and destroy a Muslim country as ‘Liberator’ all these conspiracies and plans of international terrorism or piracy is planned in UK under the supervision of USA (in other words although Europeans have veiled themselves as civilized nations but the hidden pirate within them could not be altered or civilized). When and where oil resources or gold resources are to be captured and transferred to Europe all these are decided into UK. In a country like Pakistan that is always begging in front of IMF and World Bank for aid, daily more than 400 to 500 million dollars are being transferred to Europe through Hundi, obviously half of this amount is also being transferred to Britain. This is why now a days the news reports of recovery of hundreds of millions of British pounds along with property of millions from the house of a top leader of Pakistani political party. Principally if this amount and property are funds raised by some political party than this should be returned to Pakistan as this property belongs to Pakistan. Why only that political leader all big leaders of Pakistan have properties in England; will British return Pakistani wealth to Pakistan? Look at the Kashmir, a haven on earth that was converted into hell by Crown of Britain by selling state of Kashmir to India before withdrawal from sub-continent. All those districts of Punjab that had to be included in Pakistan due to majority of Muslims were handed over to India to create access for India to Kashmir. Due to this blunder of Hindu-Christian nexus the greatest migration of the world’s history took place. During this migration millions of Muslim was murdered, women and girls raped and kidnapped by Indian supported Sikhs. These wounds might fill up with the passage of time but the wound that was given by UK in the form of handing over Kashmir having Muslim majority to India has been converted into cancer. In Indian Held Kashmir more than 0.7 million Indian armed forces violating human rights and indulged in state terrorism in the form of genocide of Muslims, although world is silent but Kashmiris people are not ready to accept the slavery of Hindu India. If we look at the history, this genocide of innocent Kashmiris Muslims and struggle against it started in 1848 when in the history of world British Imperialism sold out Kashmir to Sikhs along with people for 7.5 million rupees and Maharaja Gulab Singh laid foundation of dark age of Dogra Raj in Kashmir. As soon as Gulab Singh came into power he banned slaughter of cow, imposed heavy taxes on business and locked up Masajid (mosques) in which Muslims were allowed only at the time of prayers. Muslim of Kashmir was not allowed to hold rituals in the Mosques. Muslims of Kashmir were ready to pay unjust taxes but not to accept ban over their religious activities. Protests destroyed the peace of the Kashmir valley. Due to limited resources of communication Muslims of sub-continent were not able to get any information about the situation of Muslims in Kashmir. Even if they had been able to get the information regarding inhuman treatment of Dogra Raj they were not able to extend any help as all the administration was either in the control of English or their fawning Hindus. As the tortures of Dogra Raj grew the protest of Muslims also increased as well. Despite of arrest of all Kashmiri leadership the protests went on that at last converted into freedom movement. 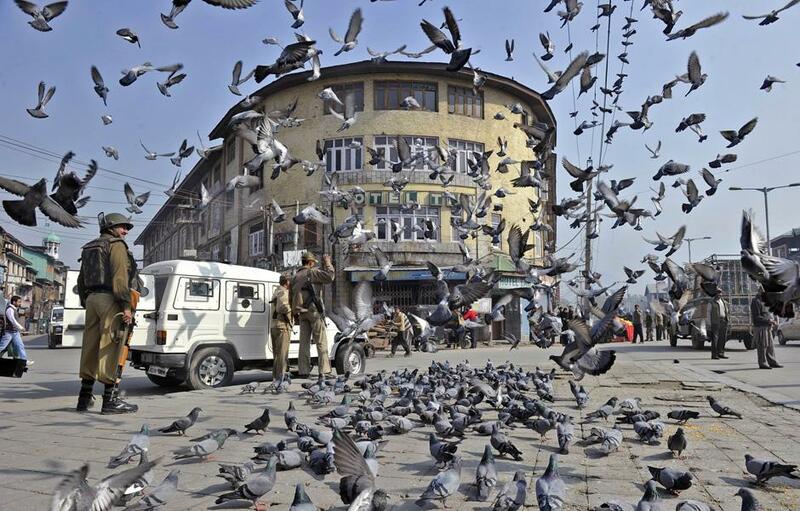 Time went by that on 25 June 1931, the struggle of Kashmiris took a new turn. Under the allegations of destroying peace and riots the trial against a Kashmiri youngster Abdul Qadir was pending from last one year. Whenever, day fixed for hearing of the case came near Kashmiris gathered around the court in numbering in thousands due to which court had to postpone the hearing. At last it was decided that hearing should be held in the prison and the day of 25 June 1931 was fixed. 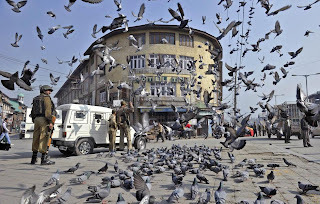 Still the Session Judge had not arrived that thousands of Kashmiris gathered around the Central Jail Srinagar. They were demanding that either trial should be open in front of all of them or Abdul Qadir should be acquitted and released. Despite of all the security measures Session Judge could not dare to enter the prison for hearing. In the meanwhile for afternoon prayer a youngster stood up and called Adhan, as soon as he said “Allah-u-Akbar (اللہ اکبر)” policemen from Dogra Police shot him dead. After his death another youngster stood up to complete the Adhan and in this way with the martyrdom of 21 Kashmiris the Adhan was completed. The martyrdom of 21 Muslims for Adhan (call for prayer) was (is) a clear message for Muslims, “beware and know the result of being under control of Hindus”. 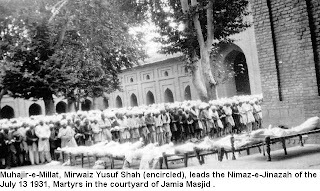 On the eve of 25 June 1931 when funerals of 21 Muslims were prepared for burial; whole valley became a picture of woe and protest. The situation was not better than today’s situation of Indian Held Kashmir. Protests, firing of police and martyrdoms of Muslims in the hands of Dogra Police became daily routine. 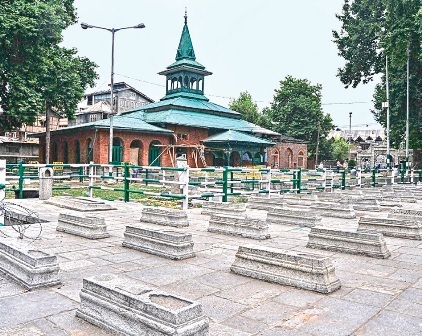 This series was going that Eid came on; when Muslims arrived Municipal Park to offer Eid prayers on 13 July 1931 they were shocked to see that whole site was surrounded by Dogra Police under the supervision of DIG. Muslims started protesting, as a result DIG ordered police to fire direct bullets on the protestors leading to martyrdom of 13 Kashmiris. Police went a step ahead and started shooting those who were collecting the dead bodies. Police chased Muslims into their houses and mosques and mutilated Holy Qurans present there. 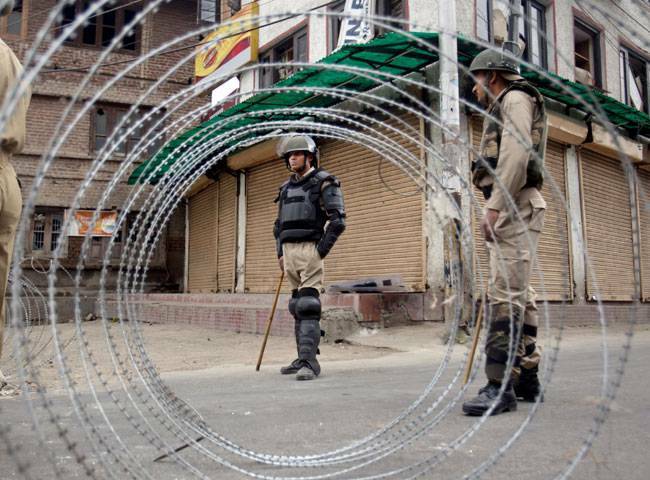 Curfew was imposed in the Srinagar which soon spread to the whole Kashmir. In order to subsidize the anger of the Kashmiri people DIG Ramchad was sent on forced leave but Kashmiris had only one demand, “Kashmiris should be given freedom; Including Ramchand all responsible policemen should be hanged”. 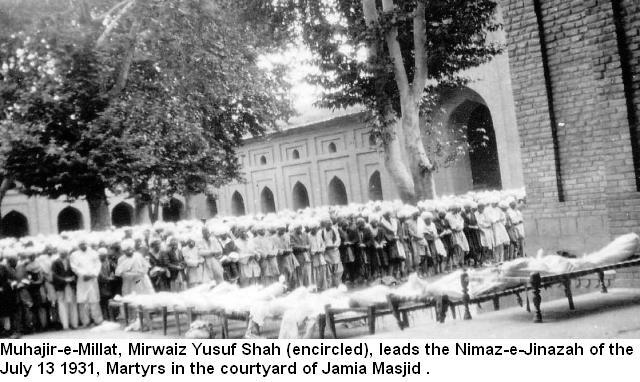 After passage of 82 years above mentioned tragedies have become part or history but the dark night that covered Kashmir on 13 July 1931 have not ended. In 1947 due to enmity towards Muslims English put Kashmir valley having 95% Muslim population was handed over to India to fulfill their friendship with Hindus. In fact this was such a conspiracy whose results Kashmiris are facing since partition but this conspiracy is also a serious threat to the peace of the region as well. 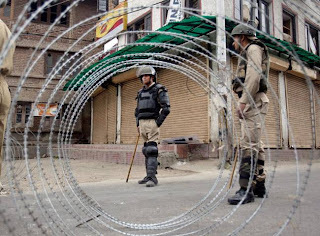 Indian state terrorists left behind the Dogra police in torture over Kashmiris, from state policy of gang rapes of Kashmiri women to genocide of Kashmiri youngsters after kidnapping what type of the torture had India not experienced over unarmed Kashmiris to suppress Freedom movement of Kashmiris? But international community has turned a deaf ear towards the state terrorism and war crimes of India in Kashmir and has been practicing criminal ignorance in this regard. This criminal ignorance proves that international community is equally responsible for the torture and genocide of Kashmiris. Western media is silent due to the interests of Europe attached with India; what does this mean that Kashmiris will be slaughtered just like that? When will they get freedom like Christians of East Timor and South Sudan? Or the right of freedom is reserved only for Christians?? ?